Some are calling it a “fumble,” but it’s possible that, like an over-taxed resident, NYC’s ‘Punxsutawney Phil’ willingly risked a head plant, rather than remain in the grip of NYC’s new leftist mayor, Bill de Blasio. Or maybe de Blasio just isn’t that comfortable working with his right. Next year he may want to consider using his left hand to try and hold on to Phil. It does seem to be more comfortable on that side. In any event, not all on lookers were amused and de Blasio even managed to frighten at least one child in attendance. Let’s hope ‘Punxsutawney Phil’ doesn’t have to depend on ObamaCare for treatment of any bumps or bruises. The city may need a new groundhog by next year. 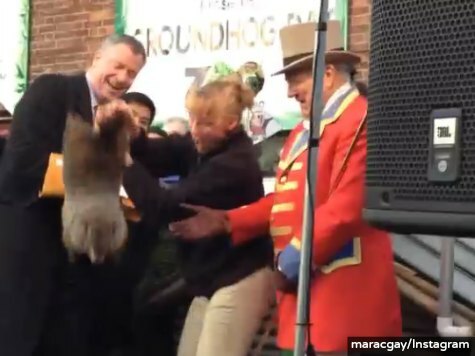 The first fumble of Super Bowl Sunday belonged to Mayor Bill de Blasio — who dropped the Staten Island Zoo’s groundhog early Sunday morning. De Blasio was trying to handle Staten Island Chuck when the anxious animal squirmed right out of the mayor’s hands and fell on his noggin.